17 March 2018 – Life Is Such A Sweet Insanity. Earl and I recently upgraded the console display in our 2016 Jeep Cherokee to include navigation. I have to admit, for a automotive company born product, it works quite well and is very intuitive. I believe the underlying operating system is QNX. Voice commands work well, but you have to be more specific with your wording versus how you would talk to Alexa or Siri and especially Google. Instead of saying “take me to the closest gas station” I’ve found you have to say “Find directions to the closest gas station.” Response is quick; she’s just picky about my verbiage. My “Great Lakes” accent is not a problem, she can parse my flat As just fine. One of the things I like is the inclusion of the speed limit for the stretch of road you’re on. I’ve watched this on and off during our travels today and it updates almost immediately when the physical speed limit changes on the roadway. With this navigation upgrade the time is also synced to GPS. That’s nice when you’re bouncing between time zones. Also, because I’m focused on these sorts of things, the clock advances when my Apple watch advances, since they’re all using the same time source. I like all clocks around me to be in sync. The navigation system offers three routes for your desired destination: the fastest, the closest, and the most economical. It will also sync with contacts lists and the like on your phone so we can say “Find directions to Jamie’s house” and it knows where we want to go. 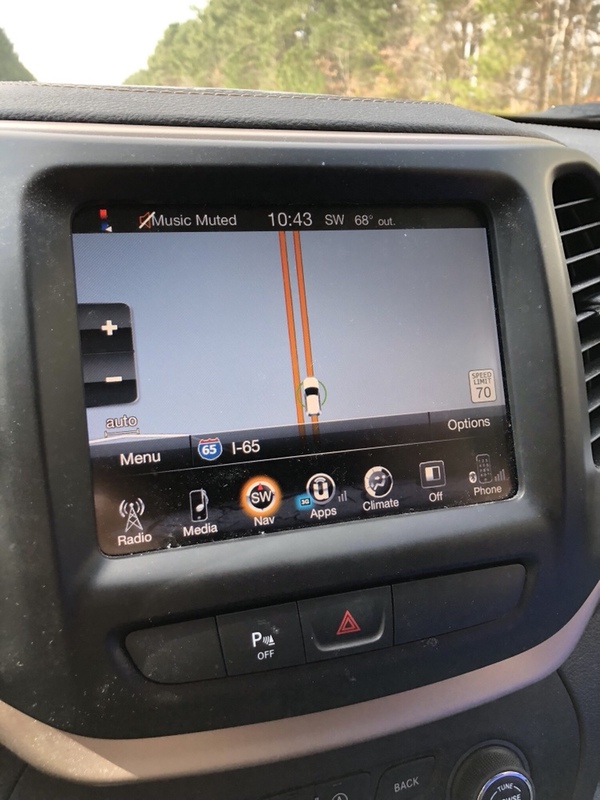 At first we thought the navigation enhancement was unnecessary because we have Google Maps or Apple Maps on our phones; but honestly, it’s nice to not fiddle around with the phone when you’re trying to get somewhere on the road. Having everything on a well laid out screen and easily accessible is a safer approach. Chrysler offered a $150 discount on the service this week and that’s what prompted us to make the purchase. The technology is very cool and the data geek is really enjoying the enhancements in the Jeep. I highly recommend the service if you’re in the market for that sort of thing.